We are often led to believe that oil paints were invented in Northern Europe, shortly before the first famous painters of the Northern Renaissance used them to such great effect. Not only is that untrue, but a more accurate account has been in the public domain for over 200 years. We owe some of this confusion to the continuing popularity of the myths promulgated by Vasari. In his first edition of Le Vite de’ più eccellenti architetti, pittori et scultori Italiani da Cimabue insino à tempi nostri (1550), Vasari claimed that it was the van Eyck brothers who invented oil painting, around 1420. Unfortunately Vasari’s account, translated into English, remains popular and influential today. In 1774, the work of Theophilus Presbyter, identified perhaps with Roger of Helmarshausen, was found to have given instructions for preparing oil paints, specifically Cinnabar (Lead) Red in linseed oil medium, in Schedula diversarium artium, dated to about 1125. Another contemporary source discovered later is Eraclius, in his Coloribus et artibus Romanorum, although that refers to heating linseed oil with lime in order to create the medium. So by the end of the eighteenth century, it was well known that oil paints were in use long before the Northern Renaissance and the likes of the van Eycks. The most convincing examples of such early oil paintings came to light in ancient churches in Scandinavia. 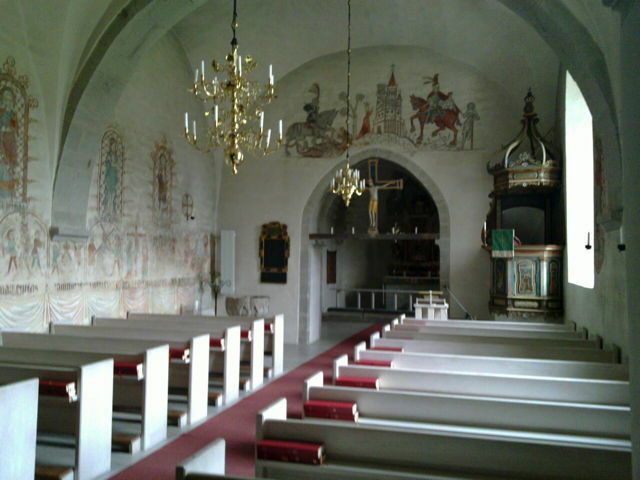 The painted altar front of the church at Tingelstad in Norway, dated to 1300-25, is one that has been studied extensively by Unn Plahter and her colleagues, and you can see modern reconstructions here. Later work on a painted crucifix from the ancient stave church at Hemse, on the island of Gotland, Sweden, dated to about 1180, showed evidence of drying oils being used on that as well. I believe that crucifix is shown here. Not only were these true artistic paintings, but examination of the structure of their paint layers has shown the use of glazes much as in classical and modern oil painting technique. In 2008, it was claimed that caves in Afghanistan, near the Bamiyan buddhas which were destroyed by the Taliban in 2001, contained even earlier oil paintings, dated to around 650 AD. However the drying oils, most probably walnut and poppyseed, found there appear with a wide range of other media and materials including plant resins, and it remains to be seen how extensively drying oils contributed to the paintings as a whole. There is also no evidence that the techniques used there were disseminated beyond Afghanistan, or continued in use within that region. For once the Classical world of the Greeks and Romans does not seem to have been there first. Although they did experiment with the use of non-drying olive oil, there does not appear to be any evidence of drying oils forming the medium for any early Mediterranean paintings. There have long been controversies about innovations which might have been introduced by the van Eyck brothers, Jan and Hubert, or secret recipes which they used to advantage in their remarkable works. Most recently these have been examined critically by Noëlle Streeton, in Perspectives on the Painting Technique of Jan van Eyck. Beyond the Ghent Altarpiece, 2013, Archetype Publications. She concludes that the works of the van Eycks are similar in materials to those of other early Netherlandish artists, and those immediately before them. However it is clear that the painting and other workshop practices of the van Eycks were sophisticated, and usually but not always involved multilayer paints, including glazes. So for the time being, there appears to have been isolated use of some form of mixed medium oil painting in Bamiyan, Afghanistan, around 650 AD. But the continuous tradition in European art goes back at least to church decoration in Scandinavia before 1200, and was already mature and sophisticated by the time of the van Eycks. Posted in Painting, Technology and tagged Bamiyan, drying oils, Hemse, oil paint, painting, Tingelstad, van Eyck, Vasari. Bookmark the permalink.